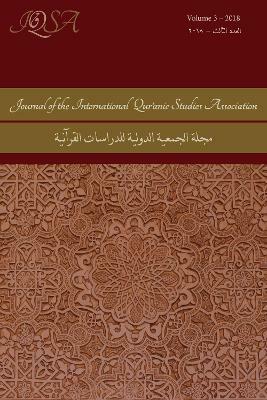 We are pleased to announce the launch of the Journal of the International Qur'anic Studies Association (JIQSA). In support of the association's mission of fostering scholarship on the Qur'an, the journal will publish twice annually. Articles will be rigorously peer-reviewed through a double-blind review process, with reviewers appointed by the Co-Editors and the international Editorial Board. The journal is being launched at a time of particular vitality and growth in Qur'anic Studies, and its primary goal is to encourage the further development of the discipline in innovative ways. Methodologies of particular interest to the journal include historical-critical, contextual-comparative, and literary approaches to the Qur'an. We welcome articles that explore the Qur'an's origins in the religious, cultural, social, and political contexts of Late Antiquity; its connections to various literary precursors, especially the scriptural and parascriptural traditions of older religious communities; the historical reception of the Qur'an in the west; the hermeneutics and methodology of Qur'anic exegesis and translation (both traditional and modern); the transmission and evolution of the textus receptus and the manuscript tradition; and the application of various literary and philological modes of investigation into Qur'anic style and compositional structure. Vanessa De Gifsis Professor in the Department of Classical and Modern Languages, Literatures, and Cultures at Wayne State University, USA.